University of the Fraser Valley Library (2015). 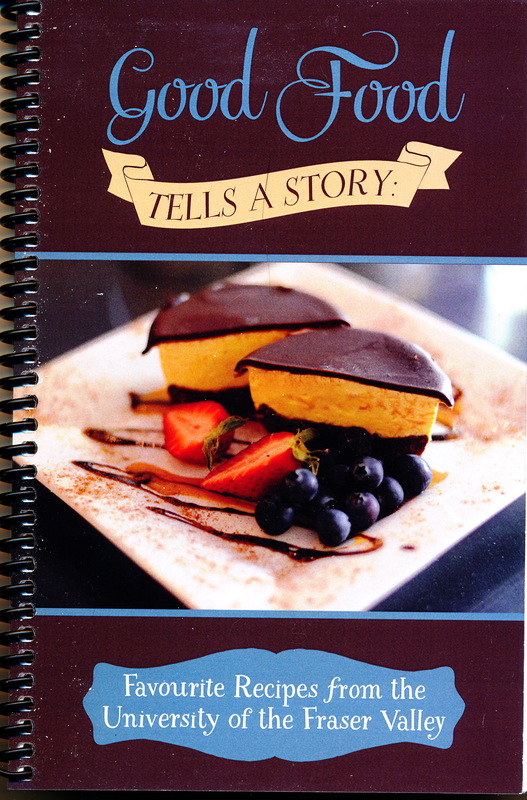 Good food tells a story, favourite recipes from the University of the Fraser Valley. Abbotsford, BC: Author. This is a recipe book assembled by faculty and staff at the University of the Fraser Valley (UFV) as a fundraiser for the Newman Western Canadian Cookbook Collection, part of their Special Collections Library. It’s a community cookbook that reflects the diverse influences and food practices of this community. It has recipe sections headed: Breakfast, Breads, Soups & Salads, Mains, Vegetables, Sweets, and Extras. The book is coil bound, 109 pages long and contains 79 recipes. Most recipes include a brief story by the contributor about the origin of the recipe, who made it, when and how it was made and tips for serving. The contributors are men and women. The stories indicate that recipe preparation is often a social event; that recipes were often learned by working with a parent or grandparent, and that food preparation today is often done cooperatively for and with other family members (pizza, overnight buns for example). Recipes were gleaned from friends, chefs, parents, and a home economics class. For many, food evokes childhood memories and recipes are a way to retain and build culture. Influences are from Scotland, England, Peru, India, Newfoundland and Labrador, and other Canadian provinces. Recipes included are traditional and novel and include oatcakes (from Scotland), naan (from India), panackelty (from England), fish and brewis (from Newfoundland), haggis, baked beans and dogberry wine (dogberry is the name for the berries of a native mountain ash in Newfoundland). The book is for experienced cooks because it does not include any guidance on measurements or abbreviations (although no abbreviations are used). An index is included. Recipes are written using only Imperial measures, not metric. If there is a collective story told by the recipes it is that UFV faculty and staff love sweets (30 pages, 24 recipes) making it the largest section in the book. Vegetable recipes are fewer — 5 in that section with three of the five recipes for potatoes. And what does it say that three of the eight salad recipes are for jellied salads? Like other community cookbooks, we can expect that the recipes offered in this book have been frequently tested in the homes of the contributors. Many are adapted from other sources. It’s a book that you will want to keep and try many of the recipes included. It is also a good example for other community groups that want to develop a cookbook. Community cookbooks often include poetry or bits of daily life philosophy but this one does not. Some photos are included and the stories that accompany the recipes make it informative and enjoyable. The coil bound format is easy to use. The length makes it very affordable ($10). The title is especially significant not necessarily for this collection but for so many recipes and food ideas. I particularly like the fact that stories about the recipes have been included. I recently made an apple dumpling recipe that I had not made in years. It was from an old favourite, Food that Really Schmecks, by Edna Staebler (1968). The stories that are attached to many of the recipes provide interesting insights into Mennonite life in the Waterloo, Ontario area. I often find reading these anecdotes soothing. They are great bedtime reading even if I never make most of the recipes. I agree that the stories invite us in and probably make it more likely that we will try the recipe. They help us connect to the past history of the recipe and invite us to continue the tradition. Interesting that you find them soothing. That’s an interesting thought that I think I will hold on to. Thanks for your reply.